I think “health and safety” was a bigger risk when those Tea Party crazies were toting around assault rifles in front of government buildings. Where were the violent crackdowns then? Why don’t you take a lesson from a baggertroll like me: see you’ve taken the wrong lesson from that whole “They had guns and the police respected their right to peacefully assemble and petition for redress of their grievances” thing? Perhaps you and your friends should talk to one of those “tea party crazies” and ask them to take you to a range and teach you how to handle a gun. Any of them I know would do that for a polite request, regardless of your politics. Yeah man grab a gun go to your local occupy camp and see what happens–my last reading of the constitution says the po-pos are gonna be bound by the law to respect your authorate! And if they don’t…well, you know, it’s not like they can do anything about it. You got guns…and they got…sissy batons. Right? Look at the top of the left side bar. Open invitation to go shooting at this (evil, libertarian, possibly tea party simpathizng) blogger’s expense regardless of your politics. By the way the guy’s my second cousin AND my uncle. We like to keep it in the family, if you know what I mean. Hey, uh, there was some nutcase with an assault rifle who showed up to an occupation somewhere in the south and he did get arrested. Oh please, do improve this comment, oh almighty exiled censor. One of the reasons the folks who did the open carry protests did NOT get arrested was… They chose places where open carry was legal. They also informed the local cops it was going to happen and pulled appropriate permits for their events. And boy oh boy was that amazing protest. 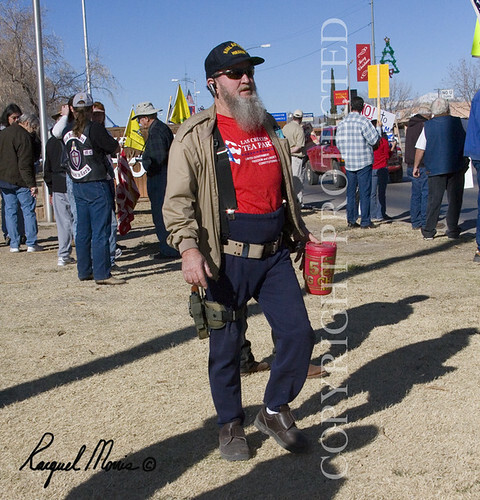 Carrying guns and super jumbo ampm mugs w/lifetime refillable diet coke…oooo…that’s really sticking it to the man, man! Got him running scared it did…And we sure looked cool doing it, didn’t we? But they’re crazy people, remember.